RadPropertyGrid supports grouping. Its IsGrouped property controls the current RadPropertyGrid's state. You can set it to true and you will have RadPropertyGrid initially grouped. If you set it to false, then you will have RadProperty sorted. By default the control is shown as sorted. Please note all the groups will be auto expanded. In case you want to initially collapse a group, you can do this once RadPropertyGrid is loaded using a Dispatcher. Please refer to the Expand/Collapse Groups section below. 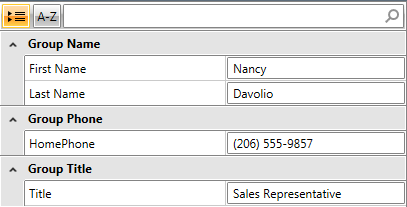 Another property you can configure is SortAndGroupButtonsVisibility. It sets the visibility mode of the sort and group buttons. By default the buttons will be visible. The user can control the group state from the UI. CollapseAllGroups(): Collapses all groups recursively. You need to set RenderMode="Flat" in order to be able to execute the methods above. For more information check Layout Rendering Modes. The GroupDefinitions property gets a collection of GroupDefinition objects used to group RadPropertyGrid. You need to set RenderMode="Flat" in order to be able to work with the GroupDefinitions collection. For more information check Layout Rendering Modes.